Mark Rothko. | The disappearance. Mark Rothko was born in Dvinsk, Vitebsk Province, Russian Empire (now Daugavpils, Latvia). His father, Jacob (Yakov) Rothkowitz, was a pharmacist and an intellectual, who provided his children with a secular and political, rather than religious, upbringing. Unlike Jews in most cities of Czarist Russia, those in Dvinsk had been spared from violent outbreaks of anti-Semitic pogroms. However, in an environment where Jews were often blamed for many of the evils that befell Russia, Rothko’s early childhood was plagued by fear. Despite Jacob Rothkowitz’s modest income, the family was highly educated, and able to speak Russian, Yiddish and Hebrew. Following Jacob’s return to Orthodox Judaism, he sent Marcus, his youngest son, to the cheder at the age of five, where he studied the Talmud although his elder siblings had been educated in the public school system. Emigration from the Russian Empire to the U.S. Fearing that his sons were about to be drafted into the Czarist army, Jacob Rothkowitz emigrated from Russia to the United States, following the path of many other Jews who left Daugavpils in the wake of Cossack purges. These émigrés included two of Jacob’s brothers, who managed to establish themselves as clothing manufacturers in Portland, Oregon, a common profession among Eastern European immigrants. Marcus remained in Russia with his mother and elder sister Sonia. They joined Jacob and the elder brothers later, arriving at Ellis Island in the winter of 1913 after 12 days at sea. Jacob’s death a few months later left the family without economic support. One of Marcus’s great aunts did unskilled labor, Sonia operated a cash register, while Marcus worked in one of his uncle’s warehouses, selling newspapers to employees. Marcus started school in the United States in 1913, quickly accelerating from third to fifth grade, and completed the secondary level with honors at Lincoln High School in Portland, in June 1921 at the age of 17. He learned his fourth language, English, and became an active member of the Jewish community center, where he proved adept at political discussions. Like his father, Rothko was passionate about such issues as workers’ rights and women’s right to contraception. He received a scholarship to Yale based on academic performance, but it has been suggested that Yale made this offer only in order to lure Rothko’s friend, Aaron Director, with a similar proposal. After one year, the scholarship ran out and Rothko took menial jobs to support his studies. 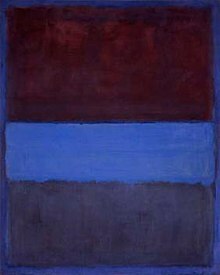 Rothko found the “WASP” Yale community to be elitist and racist. He and Aaron Director started a satirical magazine The Yale Saturday Evening Pest, which lampooned the school’s stuffy, bourgeois attitude. Following his second year, Rothko dropped out, and did not return until he was awarded an honorary degree 46 years later. In the autumn of 1923, Rothko found work in New York’s garment district and took up residence on the Upper West Side. While visiting a friend at the Art Students League of New York, he saw students sketching a model. According to Rothko, this was the beginning of his life as an artist. Even his self-described “beginning” at the Art Students League of New York was not whole-hearted commitment; two months after he returned to Portland to visit his family, he joined a theater group run by Clark Gable‘s wife, Josephine Dillon. Whatever his dramatic ability may have been, he looked nothing like the successful actors of the day, and to him professional acting seemed an improbable career. Returning to New York, Rothko briefly enrolled in the Grand Central School of Art, where one of his instructors was the artist Arshile Gorky. This was probably his first encounter with a member of the “avant-garde”. That autumn, he took courses at the Art Students League of New York taught by still-life artist Max Weber, a fellow Russian Jew. It was due to Weber that Rothko began to see art as a tool of emotional and religious expression, and Rothko’s paintings from this era reveal a Weberian influence. Rothko’s move to New York established him in a fertile artistic atmosphere. Modernist painters had shows in the New York galleries, and the city’s museums were an invaluable resource to foster a budding artist’s knowledge, experience and skills. Among those early influences were the works of the German Expressionists, the surrealist work of Paul Klee, and the paintings of Georges Rouault. In 1928, Rothko exhibited works with a group of other young artists at the appropriately named Opportunity Gallery. His paintings included dark, moody, expressionist interiors, as well as urban scenes, and were generally well accepted among critics and peers. Despite modest success, Rothko still needed to supplement his income, and in 1929 he began giving classes in painting and clay sculpture at the Center Academy, where he remained as teacher until 1952. During this time, he met Adolph Gottlieb, who, along with Barnett Newman, Joseph Solman, Louis Schanker, and John Graham, was part of a group of young artists surrounding the painter Milton Avery, fifteen years Rothko’s senior. Avery’s stylized, natural scenes, utilizing a rich knowledge of form and color, would be a tremendous influence on Rothko. Soon, Rothko’s paintings took on Averian subject matter and color, as in Bathers, or Beach Scene of 1933/34. Rothko, Gottlieb, Newman, Solman, Graham, and their mentor, Avery, spent considerable time together, vacationing at Lake George and Gloucester, Massachusetts, spending their day painting and their evenings discussing art. During a 1932 visit to Lake George, Rothko met Edith Sachar, a jewelry designer, whom he married on November 12. The following summer, Rothko’s first one-man show was held at the Portland Art Museum, consisting mostly of drawings and aquarelles, as well as the works of Rothko’s pre-adolescent students from the Center Academy. His family was unable to understand Rothko’s decision to be an artist, especially considering the dire economic situation of the Depression. Having suffered serious financial setbacks, the Rothkowitzes were mystified by Rothko’s seeming indifference to financial necessity; they felt he was doing his mother a disservice by not finding a more lucrative and realistic career. Returning to New York, Rothko had his first East Coast one-man show at the Contemporary Arts Gallery. He showed fifteen oil paintings, mostly portraits, along with some aquarelles and drawings. 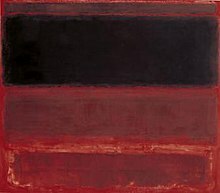 It was the oils that would capture the critics’ eye; Rothko’s use of rich fields of colors moved beyond Avery’s influence. In late 1935, Rothko joined with Ilya Bolotowsky, Ben-Zion, Adolph Gottlieb, Lou Harris, Ralph Rosenborg, Louis Schanker and Joseph Solman to form “The Ten” (Whitney Ten Dissenters), whose mission (according to a catalog from a 1937 Mercury Gallery show) was “to protest against the reputed equivalence of American painting and literal painting.” Rothko’s style was already evolving in the direction of his renowned later works, yet, despite this newfound exploration of color, Rothko turned his attention to another formal and stylistic innovation, inaugurating a period of surrealist paintings influenced by mythological fables and symbols. He was earning a growing reputation among his peers, particularly among the group that formed the Artists’ Union. Begun in 1937, and including Gottlieb and Soloman, the group’s plan was to create a municipal art gallery to show self-organized group exhibitions. The Artists’ Union was a cooperative which brought together resources and talent of various artists to create an atmosphere of mutual admiration and self-promotion. In 1936, the group showed at the Galerie Bonaparte in France. Then, in 1938, a show was held at the Mercury Gallery, in direct defiance of the Whitney Museum, which the group regarded as having a provincial, regionalist agenda. It was also during this period that Rothko, like many artists, found employment with the Works Progress Administration, a labor relief agency created under Roosevelt‘s New Deal in response to the economic crisis. As the Depression waned, Rothko continued on in government service, working for TRAP, an agency that employed artists, architects and laborers in the restoration and renovation of public buildings. Many other important artists were also employed by TRAP, including Avery, DeKooning, Pollock, Reinhardt, David Smith, Louise Nevelson, eight of the “Ten” artists of the dissenter group, and Rothko’s old teacher, Arshile Gorky. Rothko was using fields of color in his aquarelles and city scenes, and his subject matter and form at this time had become non-intellectual. Rothko’s work matured from representation and mythological subjects into rectangular fields of color and light, that later culminated – or self-destructed – in his final works for the Rothko Chapel. However, between the primitivist and playful urban scenes and aquarelles of the early period, and the late, transcendent fields of color, was a period of transition. It was a rich and complex milieu which included two important events in Rothko’s life: the onset of World War II, and his reading of Friedrich Nietzsche. Rothko separated from his wife, Edith Sachar, in the summer of 1937, following Edith’s increased success in the jewelry business. Rothko helped with his wife’s business, but did not enjoy it. At this time, Rothko was, in comparison, a financial failure. He and Sachar reconciled several months later, yet their relationship remained tense. On February 21, 1938, Rothko finally became a citizen of the United States, prompted by fears that the growing Nazi influence in Europe might provoke sudden deportation of American Jews. In a related political development, following the Hitler-Stalin Pact of 1939, Rothko, along with Avery, Gottlieb, and others, left the American Artists’ Congress in order to dissociate themselves from the Congress’s alignment with radical Communism. In June, Rothko and a number of other artists formed the Federation of Modern Painters and Sculptors. Their aim was to keep their art free from political propaganda. Because of his fears of anti-Semitism, in January 1940 he abbreviated his name from “Marcus Rothkowitz” to “Mark Rothko”. The name “Roth”, a common abbreviation, had become, as a result of its commonality, identifiably Jewish, therefore he settled upon “Rothko”. Fearing that modern American painting had reached a conceptual dead end, Rothko was intent upon exploring subjects other than urban and natural scenes. He sought subjects that would complement his growing concern with form, space, and color. The world crisis of war lent this search an immediacy, because he insisted that the new subject matter be of social impact, yet able to transcend the confines of current political symbols and values. In his essay, “The Romantics Were Prompted”, published in 1949, Rothko argued that the “archaic artist … found it necessary to create a group of intermediaries, monsters, hybrids, gods and demigods” in much the same way that modern man found intermediaries in Fascism and the Communist Party. For Rothko, “without monsters and gods, art cannot enact a drama”. Rothko’s use of mythology as a commentary on current history was not novel. Rothko, Gottlieb, and Newman read and discussed the works of Freud and Jung, in particular their theories concerning dreams and the archetypes of the collective unconscious, and understood mythological symbols as images that refer to themselves, operating in a space of human consciousness that transcends specific history and culture. Rothko later said his artistic approach was “reformed” by his study of the “dramatic themes of myth”. He apparently stopped painting altogether for the length of 1940, and read Freud’s The Interpretation of Dreams and Sir James Frazer‘s The Golden Bough. Rothko’s new vision would attempt to address modern man’s spiritual and creative mythological requirements. The most crucial philosophical influence on Rothko in this period was Friedrich Nietzsche‘s The Birth of Tragedy. Nietzsche claimed that Greek tragedy had the function of the redemption of man from the terrors of mortal life. The exploration of novel topics in modern art ceased to be Rothko’s goal; from this point on, his art would bear the ultimate aim of relieving modern man’s spiritual emptiness. He believed that this “emptiness” was created partly by the lack of a mythology, which could, as described by Nietzsche, “[address]… the growth of a child’s mind and – to a mature man his life and struggles”. Rothko believed that his art could free the unconscious energies previously liberated by mythological images, symbols, and rituals. He considered himself a “mythmaker”, and proclaimed “the exhilarated tragic experience, is for me the only source of art”. Many of his paintings of this period contrast barbaric scenes of violence with those of civilized passivity, with imagery drawn primarily from Aeschylus‘s Oresteia trilogy. In his 1942 painting, The Omen of the Eagle, the archetypal images of, in Rothko’s words, “man, bird, beast and tree … merge into a single tragic idea.” The bird, an eagle, was not without contemporary historical relevance, as both the United States and Germany (in its claim to inheritance of the Holy Roman Empire) used the eagle as a national symbol. Rothko’s cross-cultural, trans-historical reading of myth perfectly addresses the psychological and emotional roots of the symbol, making it universally available to anyone who might wish to see it. A list of the titles of the paintings from this period is illustrative of Rothko’s use of myth: Antigone, Oedipus, The Sacrifice of Iphigenia, Leda, The Furies, Altar of Orpheus. Judeo-Christian imagery is evoked: Gethsemane, The Last Supper, Rites of Lilith, as are Egyptian (Room in Karnak) and Syrian (The Syrian Bull). Soon after the war, Rothko felt his titles were limiting the larger, transcendent aims of his paintings, and so removed them altogether. At the root of Rothko and Gottlieb’s presentation of archaic forms and symbols as subject matter illuminating modern existence had been the influence of Surrealism, Cubism, and abstract art. In 1936, Rothko attended two exhibitions at the Museum of Modern Art, “Cubism and Abstract Art,” and “Fantastic Art, Dada and Surrealism,” which greatly influenced his celebrated 1938 Subway Scene. In 1942, following the success of shows by Ernst, Miró, Tanguy, and Salvador Dalí, who had immigrated to the United States because of the war, Surrealism took New York by storm. Rothko and his peers, Gottlieb and Newman, met and discussed the art and ideas of these European pioneers, especially those of Mondrian. They began to regard themselves as heirs to the European avant-garde. With mythic form as a catalyst, they would merge the two European styles of Surrealism and abstraction. As a result, Rothko’s work became increasingly abstract; perhaps ironically, Rothko himself described the process as being one toward “clarity”. Rothko’s vision of myth as a replenishing resource for an era of spiritual void had been set in motion decades before, by his reading of Carl Jung, T. S. Eliot, James Joyce and Thomas Mann, among others. Unlike his predecessors, Rothko would, in his later period, develop his philosophy of the tragic ideal into the realm of pure abstraction. He thereby questioned the possibility for mankind to transform a cradle of imagery into a new set of images, no longer dependent on tribal, archaic, and religious mythologies – the very symbols Rothko had utilized and struggled with during his middle period. Rothko’s 1945 masterpiece, “Slow Swirl at Edge of Sea” illustrates his newfound propensity towards abstraction. Sometimes it is interpreted as a meditation on Rothko’s courtship of his second wife, Mary Ellen “Mell” Beistle, whom he met in 1944 and married in the spring of 1945. The painting presents two humanlike forms embraced in a swirling, floating atmosphere of shapes and colors, in subtle grays and browns. The rigid rectangular background foreshadows Rothko’s later experiments in pure color. The painting was completed, not coincidentally, in the year the Second World War ended. Despite the abandonment of his “Mythomorphic Abstractionism” (as described by ARTnews), Rothko would still be recognized by the public primarily for his “Surrealist” works, for the remainder of the 1940s. The Whitney Museum included them in their annual exhibit of Contemporary Art from 1943 to 1950. The year 1946 saw the creation of Rothko’s transitional “multiform” paintings. The term “multiform” has been applied by art critics; this word was never used by Rothko himself, yet it is an accurate description of these paintings. Several of them, including No. 18 (1948) and Untitled (also 1948), are masterpieces in their own right. Rothko himself described these paintings as possessing a more organic structure, and as self-contained units of human expression. For Rothko, these blurred blocks of various colors, devoid of landscape or human figure, let alone myth and symbol, possessed their own life force. They contained a “breath of life” he found lacking in most figurative painting of the era. This new form seemed filled with possibility, whereas his experimentation with mythological symbolism had become a tired formula, in much the same way as he viewed his late 1930s experiments in urban settings. The “multiforms” brought Rothko to a realization of his mature, signature style, and was the only style Rothko would never fully abandon prior to his death. Rothko, in the middle of a crucial period of transition, had been impressed by Clyfford Still’s abstract fields of color, which were influenced in part by the landscapes of Still’s native North Dakota. In 1947, during a summer semester teaching at the California School of Fine Art, Rothko and Still flirted with the idea of founding their own curriculum, and they realized the idea in New York in the following year. Named “The Subjects of the Artists School”, they employed David Hare and Robert Motherwell, among others. Though the group was short-lived and separated later in the same year, the school was the center of a flurry of activity in contemporary art. In addition to his teaching experience, Rothko began to contribute articles to two new art publications, “Tiger’s Eye” and “Possibilities”. Using the forums as an opportunity to assess the current art scene, Rothko also discussed in detail his own artwork and philosophy of art. These articles reflect the elimination of figurative elements from his work. He described his new method as “unknown adventures in an unknown space”, free from “direct association with any particular, and the passion of organism”. In 1949, Rothko became fascinated by Matisse‘s Red Studio, acquired by the Museum of Modern Art that year. He later credited it as a key source of inspiration for his later abstract paintings. No. 3/No. 13 (Magenta, Black, Green on Orange), 1949, 85 3/8″ × 65″ (216.5 × 164.8 cm), oil on canvas, Museum of Modern Art. 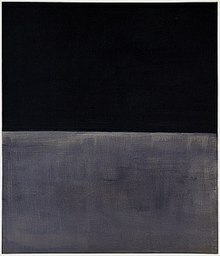 An example of Rothko’s late period. He even went so far as to recommend that a viewer position themselves as little as 18 inches away from the canvas so that the viewer might experience a sense of intimacy, as well as awe, a transcendence of the individual, and a sense of the unknown. As Rothko achieved success, he became increasingly protective of his works, turning down several potentially important sales and exhibition opportunities. Again, Rothko’s aims, in some critics’ and viewers’ estimation, exceeded his methods. Many of the abstract expressionists exhibited pretensions for something approximating a spiritual experience, or at least an experience that exceeded the boundaries of the purely aesthetic. In later years, Rothko emphasized the spiritual aspect of his artwork, a sentiment that would culminate in the construction of the Rothko Chapel. Many of the “multiforms” and early signature paintings display an affinity for bright, vibrant colors, particularly reds and yellows, expressing energy and ecstasy. By the mid 1950s, however, close to a decade after the completion of the first “multiforms”, Rothko began to employ dark blues and greens; for many critics of his work this shift in colors was representative of a growing darkness within Rothko’s personal life. The general method for these paintings was to apply a thin layer of binder mixed with pigment directly onto uncoated and untreated canvas, and to paint significantly thinned oils directly onto this layer, creating a dense mixture of overlapping colors and shapes. His brush strokes were fast and light, a method he would continue to use until his death. His increasing adeptness at this method is apparent in the paintings completed for the Chapel. With a total lack of figurative representation, what drama there is to be found in a late Rothko is in the contrast of colors, radiating, as it were, against one another. His paintings can then be likened to a sort of fugal arrangement: each variation counterpoised against one another, yet all existing within one architectonic structure. Rothko used several original techniques that he tried to keep secret even from his assistants. Electron microscopy and ultraviolet analysis conducted by the MOLAB showed that he employed natural substances such as egg and glue, as well as artificial materials including acrylic resins, phenol formaldehyde, modified alkyd, and others. One of his objectives was to make the various layers of the painting dry quickly, without mixing of colors, such that he could soon create new layers on top of the earlier ones. Rothko and his wife visited Europe for five months in early 1950. The last time he had been in Europe was during his childhood in Latvia, at that time part of Russia. Yet he did not return to his motherland, preferring to visit the important museums of England, France and Italy. He much admired European art, and he visited the major museums of Paris. Besides viewing many paintings, the architecture and the music of Europe left a deep impression on Rothko. The frescoes of Fra Angelico in the monastery of San Marco at Florence most impressed him. Angelico’s intimately bright tempera frescoes magnificently contrast with the grandeur and monastic serenity of the surrounding architecture. Certainly the spirituality and concentration on light appealed to Rothko’s sensibilities, as did Angelico’s economic circumstances, which Rothko saw as similar to his own, having always been forced to struggle to exist as an artist. Of Angelico, Rothko stated “As an artist you have to be a thief and steal a place for yourself on the rich man’s wall.” He felt he was still struggling, despite some promising developments, including the sale of a painting for one thousand dollars to Mrs. John D. Rockefeller III and the purchase of “Number 10” (1950) for the Museum of Modern Art. Rothko had one-man shows at the Betty Parsons Gallery in 1950 and 1951, and at other galleries across the world, including Japan, São Paulo and Amsterdam. The 1952 “Fifteen Americans” show curated by Dorothy Canning Miller at the Museum of Modern Art formally heralded the abstract artists, including works by Jackson Pollock and William Baziotes. It also created a dispute between Rothko and Barnett Newman, after Newman accused Rothko of having attempted to exclude him from the show. Growing success as a group led to infighting, and claims to supremacy and leadership. When “Fortune” magazine named a Rothko painting as a good investment, Newman and Still, out of jealousy, branded him a sell-out, secretly possessing bourgeois aspirations. Still wrote to Rothko to request the paintings he had given Rothko over the years. Rothko was deeply depressed by his former friends’ jealousy. During the 1950 Europe trip, Rothko’s wife became pregnant. On December 30, when they were back in New York, she gave birth to a daughter, Kathy Lynn, called “Kate” in honor of Rothko’s mother. Shortly thereafter, due to the Fortune magazine plug and further purchases by clients, Rothko’s financial situation began to improve. In addition to sales of paintings, he also had money from his teaching position at Brooklyn College. In 1954, he exhibited in a solo show at the Art Institute of Chicago, where he met art dealer Sidney Janis, who represented Pollock and Franz Kline. Their relationship proved mutually beneficial. For Rothko, color is “merely an instrument”. The “multiforms” and the signature paintings are, in essence, the same expression of “basic human emotions”, as his surrealistic mythological paintings, albeit in a more pure form. What is common among these stylistic innovations is a concern for “tragedy, ecstasy and doom”. Rothko’s comment on viewers breaking down in tears before his paintings that may have convinced the De Menils to construct the Rothko Chapel. Whatever Rothko’s feeling about the audience or the critical establishment’s interpretation of his work, it is apparent that, by 1958, the spiritual expression he meant to portray on canvas was growing increasingly dark. His bright reds, yellows and oranges were subtly transformed into dark blues, greens, grays and blacks. In November 1958, Rothko gave an Address to Pratt Institute. In the address, he discusses Art as a trade and offers, “The recipe of a work of art – its ingredients – how to make it – the formula. 1. There must be a clear preoccupation with death – intimations of mortality… Tragic art, romantic art, etc., deals with the knowledge of death. 2. Sensuality. Our basis of being concrete about the world. It is a lustful relationship to things that exist. 3. Tension. Either conflict or curbed desire. 4. Irony, This is a modern ingredient – the self-effacement and examination by which a man for an instant can go on to something else. 5. Wit and play… for the human element. 6. The ephemeral and chance… for the human element. 7. Hope. 10% to make the tragic concept more endurable. In 1958, Rothko was awarded the first of two major mural commissions that proved both rewarding and frustrating. The beverage company Joseph Seagram and Sons had recently completed their new building on Park Avenue, designed by architects Mies Van der Rohe and Philip Johnson. 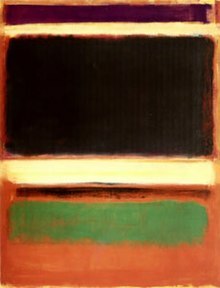 Rothko agreed to provide paintings for the building’s new luxury restaurant, The Four Seasons. For Rothko, this commission presented a new challenge for it was the first time he was required not only to design a coordinated series of paintings, but to produce an artwork space concept for a large, specific interior. Over the following three months, Rothko completed forty paintings, three full series in dark red and brown. He altered his horizontal format to vertical to complement the restaurant’s vertical features: columns, walls, doors and windows. While in Europe, the Rothkos traveled to Rome, Florence, Venice and Pompeii. In Florence, he visited Michelangelo‘s Laurentian Library, to see first-hand the library’s vestibule, from which he drew further inspiration for the murals. He remarked that the “room had exactly the feeling that I wanted […] it gives the visitor the feeling of being caught in a room with the doors and windows walled-in shut.” Further he was influenced by the sombre colors of the murals in the Pompeiian Villa of the Mysteries. Following the trip to Italy, the Rothkos voyaged to Paris, Brussels, Antwerp and Amsterdam, before returning to the United States. Once back in New York, Rothko and wife Mell visited the near-completed Four Seasons restaurant. Upset with the restaurant’s dining atmosphere, which he considered pretentious and inappropriate for the display of his works, Rothko immediately refused to continue the project, and returned the commission cash advance to the Seagram and Sons Company. Seagram had intended to honor Rothko’s emergence to prominence through his selection, and his breach of contract and public expression of outrage were unexpected. Rothko kept the commissioned paintings in storage until 1968. Given that Rothko had known in advance about the luxury decor of the restaurant and the social class of its future patrons, the exact motives for his abrupt repudiation remain mysterious. Rothko never fully explained his conflicted emotions over the incident, which exemplified his temperamental personality. The final series of Seagram Murals was dispersed and now hangs in three locations: London’s Tate Modern, Japan’s Kawamura Memorial Museum and the National Gallery of Art in Washington, D.C. In October 2012, Black on Maroon, one of the paintings in the Seagram series, was defaced with writing in black ink while on display at Tate Modern, by Wlodzimierz Umaniec. It was estimated that restoration of the painting might take up to 18 months to complete. The BBC‘s Arts Editor Will Gompertz explained that the ink from Umaniec’s marker pen had bled all the way through the canvas, causing “a deep wound not a superficial graze” and that the vandal had caused “significant damage”. In the Tower: Mark Rothko, an exhibit featuring Rothko’s 1964 black-on-black paintings from Rothko Chapel. The exhibit is inside the National Gallery of Art‘s East Building, Tower Gallery, (main tower, pictured) in Washington, D.C.
Rothko’s first completed space was created in the Phillips Collection in Washington, D.C., following the purchase of four paintings by collector Duncan Phillips. Rothko’s fame and wealth had substantially increased; his paintings began to sell to notable collectors, including the Rockefellers. In January 1961, Rothko sat next to Joseph Kennedy at John F. Kennedy‘s inaugural ball. Later that year, a retrospective of his work was held at the Museum of Modern Art, to considerable commercial and critical success. In spite of this newfound notoriety, the art world had already turned its attention from the now passé abstract expressionists to the “next big thing”, Pop Art, particularly the work of Warhol, Lichtenstein, and Rosenquist. Rothko labeled Pop-Art artists “charlatans and young opportunists”, and wondered aloud during a 1962 exhibition of Pop Art, “are the young artists plotting to kill us all?” On viewing Jasper Johns‘s flags, Rothko said, “we worked for years to get rid of all that.” It was not that Rothko could not accept being replaced, so much as an inability to accept what was replacing him: he found it vapid. Rothko received a second mural commission project, this time a wall of paintings for the penthouse of Harvard University’s Holyoke Center. He made twenty-two sketches, from which six murals were completed and only five were installed. Harvard President Nathan Pusey, following an explanation of the religious symbology of the Triptych, had the paintings hung in January 1963, and later shown at the Guggenheim. During installation, Rothko found the paintings to be compromised by the room’s lighting. Despite the installation of fiberglass shades, the paintings were removed in the late 1970s and, due to the fugitive nature of some of the red pigments, were placed in dark storage and displayed only periodically. On August 31, 1963, Mell gave birth to a second child, Christopher. That autumn, Rothko signed with the Marlborough Gallery for sales of his work outside the United States. Stateside, he continued to sell the artwork directly from his studio. Bernard Reis, Rothko’s financial advisor, was also, unbeknownst to the artist, the Gallery’s accountant and, together with his co-workers, was later responsible for one of art history’s largest scandals. The Rothko Chapel is located adjacent to the Menil Collection and The University of St. Thomas in Houston, Texas. The building is small and windowless. It is a geometric, “postmodern” structure, located in a turn-of-the-century middle-class Houston neighborhood. The Chapel, the Menil Collection, and the nearby Cy Twombly gallery were funded by Texas oil millionaires John and Dominique de Menil. In 1964, Rothko moved into his last New York studio at 157 East 69th Street, equipping the studio with pulleys carrying large walls of canvas material to regulate light from a central cupola, to simulate lighting he planned for the Rothko Chapel. Despite warnings about the difference in light between New York and Texas, Rothko persisted with the experiment, setting to work on the canvases. Rothko told friends he intended the Chapel to be his single most important artistic statement. He became considerably involved in the layout of the building, insisting that it feature a central cupola like that of his studio. Architect Philip Johnson, unable to compromise with Rothko’s vision, left the project in 1967, and was replaced with Howard Barnstone and Eugene Aubry. The architects frequently flew to New York to consult, and on one occasion brought with them a miniature of the building for Rothko’s approval. For Rothko, the Chapel was to be a destination, a place of pilgrimage far from the center of art (in this case, New York) where seekers of Rothko’s newly “religious” artwork could journey. Initially, the Chapel, now non-denominational, was to be specifically Roman Catholic, and during the first three years of the project (1964–67) Rothko believed it would remain so. Thus, Rothko’s design of the building and the religious implications of the paintings were inspired by Roman Catholic art and architecture. Its octagonal shape is based on the Byzantine church of St. Maria Assunta, and the format of the triptychs is based on paintings of the Crucifixion. The De Menils believed the universal “spiritual” aspect of Rothko’s work would complement the elements of Roman Catholicism. Rothko’s painting technique required considerable physical stamina that the ailing artist was no longer able to muster. To create the paintings he envisioned, Rothko was forced to hire two assistants to apply the chestnut-brown paint in quick strokes of several layers: “brick reds, deep reds, black mauves”. On half of the works, Rothko applied none of the paint himself, and was for the most part content to supervise the slow, arduous process. He felt the completion of the paintings to be “torment” and the inevitable result was to create “something you don’t want to look at”. The Chapel is the culmination of six years of Rothko’s life and represents his gradually growing concern for the transcendent. For some, to witness these paintings is to submit one’s self to a spiritual experience, which, through its transcendence of subject matter, approximates that of consciousness itself. It forces one to approach the limits of experience and awakens one to the awareness of one’s own existence. For others, the Chapel houses 14 large paintings whose dark, nearly impenetrable surfaces represent hermeticism and contemplation. The Chapel paintings consist of a monochrome triptych in soft brown on the central wall (three 5-by-15-foot panels), and a pair of triptychs on the left and right made of opaque black rectangles. Between the triptychs are four individual paintings (11 by 15 feet each), and one additional individual painting faces the central triptych from the opposite wall. The effect is to surround the viewer with massive, imposing visions of darkness. Despite its basis in religious symbolism (the triptych) and less-than-subtle imagery (the crucifixion), the paintings are difficult to attach specifically to traditional Christian symbolism, and may act on the viewers subliminally. Active spiritual or aesthetic inquiry may be elicited from the viewer in the same way as a religious icon having specific symbolism. In this way, Rothko’s erasure of symbols both removes and creates barriers to the work. In the spring of 1968, Rothko was diagnosed with a mild aortic aneurysm (defect in the arterial wall, that gradually leads to outpouching of the vessel and at times frank rupture). Ignoring doctor’s orders, Rothko continued to drink and smoke heavily, avoided exercise, and maintained an unhealthy diet. However, he did follow the medical advice given not to paint pictures larger than a yard in height, and turned his attention to smaller, less physically strenuous formats, including acrylics on paper. Meanwhile, Rothko’s marriage had become increasingly troubled, and his poor health and impotence resulting from the aneurysm compounded his feeling of estrangement in the relationship. Rothko and his wife Mell separated on New Year’s Day 1969, and he moved into his studio. On February 25, 1970, Oliver Steindecker, Rothko’s assistant, found the artist in his kitchen, lying dead on the floor in front of the sink, covered in blood. He had sliced his arms with a razor found lying at his side. During autopsy it was discovered he had also overdosed on anti-depressants. He was 66 years old. The Seagram Murals arrived in London for display at the Tate Gallery on the very day of his suicide. Rothko’s grave at East Marion Cemetery, East Marion, New York. Shortly before his death, Rothko and his financial advisor, Bernard Reis, had created a foundation intended to fund “research and education” that would receive the bulk of Rothko’s work following his death. Reis later sold the paintings to the Marlborough Gallery at substantially reduced values, and then split the subsequent profits from sales to customers with Gallery representatives. In 1971, Rothko’s children filed a lawsuit against Reis, Morton Levine, and Theodore Stamos, the executors of his estate, over the sham sales. The lawsuit continued for more than 10 years and became known as the Rothko Case. In 1975, the defendants were found liable for negligence and conflict of interest, were removed as executors of the Rothko estate by court order, and, along with Marlborough Gallery, were required to pay a $9.2 million damages judgment to the estate. This amount represents merely a very small fraction of the eventual vast financial value achieved since then for collectors and exhibitors of the numerous Rothko works produced in his lifetime. Rothko’s remains were first buried in East Marion Cemetery on the North Fork of Long Island, New York, in a plot belonging to Stamos, an artist who had been a friend of Rothko. Beginning in 2006, Rothko’s children, Dr. Kate Rothko Prizel, and her brother, Christopher Rothko, sought to disinter Rothko’s remains and reinter them, together with his wife’s remains, in Sharon Gardens in Kensico Cemetery in Valhalla, New York. In April 2008, Justice Arthur G. Pitts of the New York State Supreme Court agreed to permit the transfer of Rothko’s remains. The plan was approved by Georgianna Savas, executor of the estate of Stamos. The complete life works on canvas of Rothko, some 836 of which are known to exist, have been individually catalogued by art historian David Anfam in his 1998 book Mark Rothko: the works on canvas : catalogue raisonné (published by Yale University Press). The settlement of his estate became the subject of the Rothko Case. A previously unpublished manuscript by Rothko about his philosophies on art, The Artist’s Reality, was edited by his son, Christopher Rothko, and was published by Yale University Press in 2006. Red, a play based on Rothko, written by John Logan, opened at the Donmar Warehouse, London, on December 3, 2009. The one-act, 90 minute play centers on the period of development of the Seagram Murals. Alfred Molina played Rothko. It was directed by the Donmar’s artistic director Michael Grandage. It had sell-out attendance. In March 2010, Red moved to the John Golden Theater  on Broadway in New York City with the same stars (Alfred Molina, Eddie Redmayne) and director. It ran from 1 April to 27 June 2010 receiving generally favorable reviews and winning six Tony awards, including Best Play. Red has subsequently been produced by Auckland Theatre Company, Berkeley Repertory Theatre, Melbourne Theatre Company and the Fortune Theatre, Dunedin. ‘Red’ opened to favorable reviews on November 8, 2012 at the Sandra Feinstein Gamm Theater in Pawtucket, RI and ran until December 16, 2012. Trinity Repertory veteran actor Fred Sullivan Jr. played Rothko and Marc Dante Mancini played Ken. It was directed by Tony Estrella. The family collection of Mark Rothko works owned by Mark Rothko Estate has been represented by The Pace Gallery, in New York, since 1978. Thankyou, Actually this is a part of my research for My final project. May you watch the short clip and read my proposal to know what i am doing :).